Whether your product is adhered by machine or you are wrapping by hand, Acme has the core for your application. They can be made in long lengths or we can custom cut them to desired widths. When the product is gone, do not leave your reorders to chance. Have your name, address and phone number printed on the inside! Inside diameters range from .317" to 15"+. Use this as your first step to determine the size tube you would like us to build for you. Ask yourself what size your product can be rolled for storage or transport and then later be unrolled comfortably. 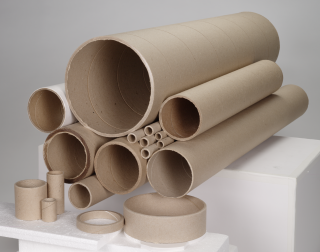 If you would like to package your merchandise in a paper tube, think in terms of the outside diameter of your product. If your application is a core, at what diameter would you like to begin winding. Our minimum wall thickness is .025". You may need a traditional mailing tube with a 1/16" wall (.0625") or your requirement may be for greater protection or perhaps a heavy-duty core at 3/8"+ wall (.375"). Maybe a mid-range wall such as 1/8" (.125") would be more appropriate. As you can see, the choices are from very thin to very heavy and everything in between. Determining the correct length is the next step in building your custom made tube or core. Just remember to add on extra length if you choose end closures that will be inserted. We'll be glad to assist you if you need help determining length. The inside of the tube is just as important as the outside. We offer printed liners (for product or manufacturer identification), as well as water or rust resistant, release papers, wax, poly, silicone, and glassine liners, to name a few. What about color just for aesthetics? We offer one color continuous spiral printing in house at no additional charge! If you require more than one color outer or inner printing, we will gladly work with you to design pre-printed paper. Your choices are almost endless. We offer everything from plain brown (natural) to designer labels. We have stock colors in various finishes, metallic & foils, unlimited choices of special order papers, or we can even match your PMS color.